Sometimes, when delivering a session on leadership, I go back to basics and start by asking what are the traits or qualities of a leader. Among the usual suspects of integrity, determination, knowledge, courage etc. reference is normally made to charisma. When pressed, however, this turns out to be something indefinable that somehow makes others want to follow you. R.J. House was more explicit, describing charismatic leaders as having an ideology baseddespite his terrible legacy, is still recognised for having had immense charismatic appeal. But the source of his charisma did not reside in him, but in the beliefs he espoused – his hatred of the Jews, his belief that all Germany’s problems stemmed from them, and his vision of how to lead Germany out of misery – all of which struck a chord with his audience, it was what they wanted to hear. 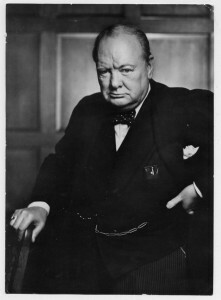 On the other side of the channel, Winston Churchill was seen as a dangerous maverick in the 1930s, but the classic prototype of the stoic British bulldog under threat during the Second World War. Again in the post-war period a more congenial and inclusive leader was required. From this perspective, charisma is perhaps best explained by Social Identity Theory, the idea that we place people in categories that are either favourable, because they support our own identity, or unfavourable, because they are deemed to be different from us. Once categorized people are either in the in-group (us) or the out-group (them). This process also produces prototypes who emulate the social identity of the group. They are most representative of the shared social identity; they exemplify what members have in common and what makes them different; and they make ‘us’ feel different and better than ‘them’. Unsurprisingly, those closest to the prototype are likely to have the most influence. They are our charismatic leaders. 1. Fundamentally, most people want to be led. They want to have someone explain in relatively simple language, what is happening, why it is happening, what is likely to happen in the future and what we are going to do about it. In short, have your own vision and a mission. 2. Role model the company culture as well as your team’s culture. Develop an image that mirrors the posture and profile of the organisation – what you all have in common (see our April blog). But also be sure to reflect the sub-culture of your team, what makes you and them different. 3. Have a clear purpose for your team. Explain why they and what they do are important for the organisation, and why the organisation is important in the wider world. Why do you and the organisation exist? What unique value do you bring to the organisation and what does the organisation bring to the world? What sets you apart? And, why and to whom do you matter?